It has been a remarkable September, and for most of the month there was little need ever to consult the weather forecast. The New England region experienced day after day of dry, sunny perfection. Oh sure, some of the kids at practice complained when the temperatures were in the 90s, but, as someone who likes it hot, it seemed like the weather was perfect for enjoying the trails and woodlands of Concord. But in the back of my mind, I knew that we needed rain, and that this apparent meteorological perfection came at a cost. A more careful look at the landscape showed the stress brought on by the dry weather. Fields were dry and faded, and trails were hard as pavement. There were days when we ran the old railroad bed on the way to Great Meadows, and our pack of runners — like a herd of migrating wildebeest — pounded the trail into dust, raised huge clouds of fine particles into the warm afternoon air. Moreover, I knew that there would be payback. Fine weather in September was all well and good, but what lay in store for October and November? One of the sad truths of this life is that you can’t bank good days and make a withdrawal when you need one; instead, you have to spend them as best you can in the moment, and trust that the future won’t bankrupt you. Or to put it another way, you can be dry and comfortable for a month, but it only takes five minutes and a sudden cloudburst before you’re drenched to the skin, and huddling in a doorway for shelter. So here we are on the last day of September, the date appointed for our first league cross country meet, and the rains have come at last. Driven by tropical storm Joaquin, the greater Boston area is expected to receive several inches of rain today, and perhaps as much as 6 to 7 inches over the next week. The thirsty landscape is grateful, but the kids are muttering about the weather. 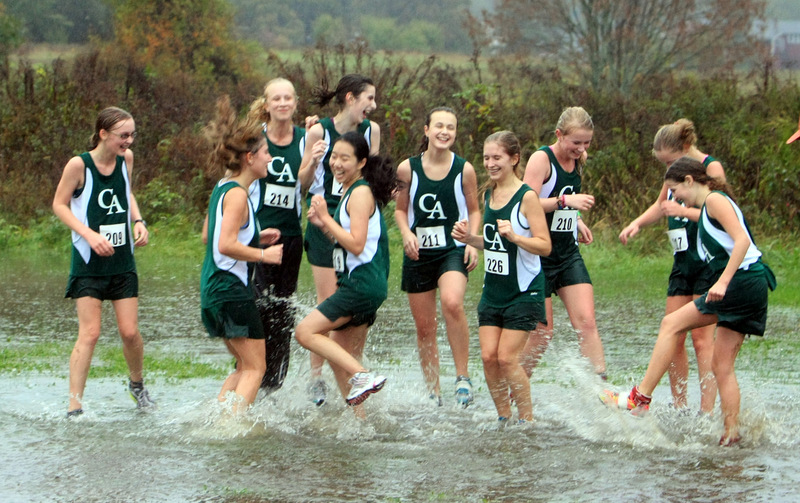 Yesterday afternoon, I talked to the team about the weather, saying the things that every cross country coach says about inclement weather: the rain, the mud, the getting soaked — this is what the sport is all about. I said to laugh at the elements, and embrace challenge of running on a course made slick and treacherous by puddles and bogs. And I told them that “nice days” were fine for postcards, but memories are made on days that you wouldn’t turn away a stray dog seeking shelter. What I didn’t say, but I thought, is that a cross country team is an ecosystem, too, and after a month of fair weather practices, it’s time to admit that there’s been something missing. The team has had fun together, has enjoyed lighthearted banter while stretching or doing core on the quad, but we haven’t faced any adversity yet — not that a warm tropical rain should be considered any great adversity. But warm or not, wet weather has a way of testing the bonds of teamwork that we’ve been trying to nurture. The pelting rain has a way of forcing everyone to think about what they’re doing out there, unprotected by their decidedly skimpy uniforms and unable to avoid permanently discoloring those fancy new running shoes. I suppose, for some of them, running in such weather forces them to wonder why they’re running at all. In almost every previous season in which I’ve coached cross-country, I didn’t really get to know my team until we ran in the rain. The rain swept away the relaxed but superficial camaraderie, and threw into relief the actual dynamics of the team — who was leading, who was following, and who was looking for a chance to sneak away from the field of battle. Until that first rainy day, it’s hard to know who’s committed to the project of running no matter what, to really be part of the team that faces difficulties and overcomes them. A downpour forces them to choose sides: on one side, the society of those who will rush headlong into the middle of a deep, muddy morass in the middle of the race route, or slog through a soaking warmup together thankful for the company; and those who are looking for a way out. On my desk at home, I have a framed picture of about a dozen girls from the 2011 Concord Academy cross country team. The picture was taken after a race at Great Brook State Park on an afternoon when an inch of rain fell and turned the course into a series of small lakes and bogs. The girls are splashing in an enormous puddle, some of them kicking water at each other, some of them just standing and laughing. All of the weather-induced worry that tested them before and during the race has vanished, and in its place, there is joy. They are children at play, and in that moment, there is absolutely nowhere that they would rather be. I don’t remember any results from that day. I can’t recall times or places, or the score of the meet. But every time I look at that beautiful picture, I remember the happiness I felt for them, for me, for everyone who weathers the storm in the company of friends. September’s sunshine was wonderful, it really was. But these last few weeks of perfection left the land and our spirits dry. We were thirsting for something else. This entry was posted in Weather and Seasons and tagged cross country, rain. Bookmark the permalink. Well said Jon! I myself was pondering the utter lack of bike commuters this morning when I rode in dodging the ducks and geese enjoying the fresh puddles. Warm rain really isn’t that bad, but many see any rain as an easy excuse to stay indoors.